Home Osnabruck Tigers Stepovic - Serbian QB to Lead a German Team in 2013. 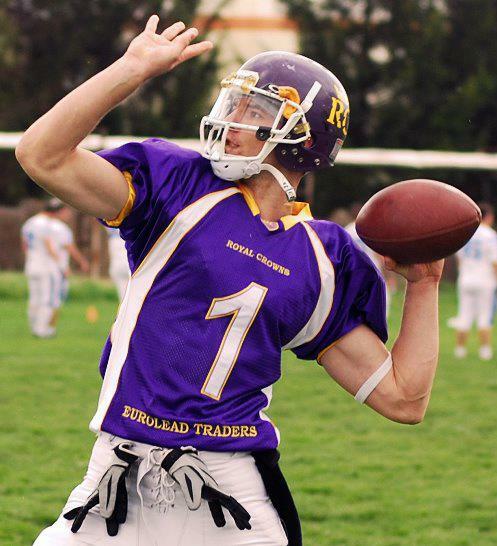 Stepovic - Serbian QB to Lead a German Team in 2013. We'd love to introduce you to a young and madly talented 20 year old athlete - Strahinja Stepovic. He has led his team - Royal Crowns to the 3rd place in Serbia. At an Awards ceremony in 2009, Stepovic was voted the best young player in Serbia. He was one of the players for Team World in 2011, in Texas. He got the Royal Crowns captain ribbon at the age of 16, which he's been wearing up until now. However, as we already covered the story - Crowns signed an American QB, because Stepovic will continue his professional career in Germany. Stepovic started as a member of the flag team at the age of 11, and as soon as he turned 15 he got to be a part of the "real deal" - leading the team in tackle football. He says he was good with "throwing the egg-like ball" at that time, and, he knew what he wants to do on the field. Leaving the "home team" is not easy. Stepovic said: "Crowns are my second family, the 6 years spent with the team are the years that will never be forgotten and I can openly say that if I could go back in time - I'd never change the year spent as the Crowns QB." Stepovic loves the spread zone read offense, and, being a QB is not his favorite position though - "I really like being the receiver because of the immense amount of collision with the opposing players and I personally believe that I could do a better job as a receiver than a quarterback. Despite that, I'm always ready to play whatever the team needs, defense and even special teams, that's how I was raised by my coaches. " Stepovic did "see the world" before his move to Germany - he was in Texas, 2011 with the Juniors World Team, and in addition to that Stepovic says: I was also practicing with the Allgau Comets. The Comets are an amazing team and Allgau is a beautiful town, nothing but compliments to the team, excellent organization, excellent practice conditions, great guys and players, they've accepted me nicely and I thank them again for that!" However, Osnabruck Tigers got him! - "Unfortunately I won't be playing for the Comets and I feel bad about that, but it's not my to decide so I won't go into that. On the other hand, the Tigers contacted as soon as I came back to Serbia, and I've decided on the way back that I'll be accepting the first offer I receive, after that I've heard from the guys that they're an excellent team, which I witnessed later. Their Head Coach and some of the players that I'm in correspondence with are amazing people and I firmly believe that I'll fit right in. I'll stay on my position as a QB, but will also try WR and special teams." About expectations and future plans: My expectations are always the ones of a champion. I'm thinking about the season in Osnabruck, we'll see what's in the store for me later, I hope I'll have a chance to continue playing in Europe. "...6 years of training, with no pause larger than a week, I can say that without a doubt, football is indeed my LIFE. "